Months before Marina was born, her parents Silvana and Peter already knew that the first few days of her life wouldn't be like most newborns. Silvana and Peter were scheduled for their first ultrasound at three months into the pregnancy. Excited about being pregnant with their first child, they were stunned to find out that their baby was showing an abnormality; her entire liver was growing outside of her abdomen. The diagnosis was omphalocele, a condition in which a large part of the abdominal wall is missing, resulting in the baby’s organs growing outside the abdomen during the gestation period. 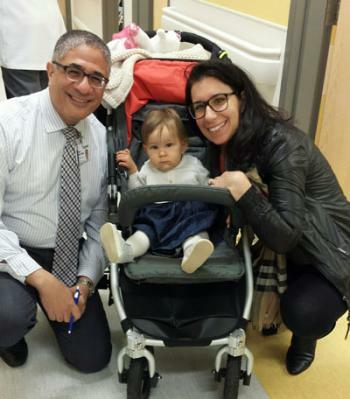 At six months, Silvana and Peter met with Dr. Sherif Emil, pediatric surgeon at the Montreal Children’s Hospital (MCH). “We knew this case was going to be severe based on prenatal ultrasounds, but we never lost hope. Hope is not statistical,” he says. Omphalocele is often accompanied by other abnormalities including chromosomal problems but fortunately, Silvana’s prenatal tests around her seventh month of pregnancy indicated there were no other issues. Silvana says that although she had months to prepare for Marina’s birth, she didn’t know what to expect. “Dr. Emil worked out a plan with us, and he explained the best and worst case scenarios,” she says. Marina was delivered by C-section at the Royal Victoria Hospital (RVH) in October, 2015. Their expectations were confirmed: her entire liver was outside her body and was contained in a clear membrane. Their worries were soon put to rest. “Considering that Marina’s case was severe and could have required multiple surgeries, it’s nothing short of a miracle that we were able to repair the abnormality in one operation,” says Dr. Emil. For three weeks after her surgery, Marina was in the care of staff in the Neonatal Intensive Care Unit and surgical ward. She is now 16 months old and, according to her mom, is a very happy and healthy baby, “Marina is our whole world,” adds the grateful mom.